Even though the language is taught in school, students spend the majority of their time at home or in the community interacting with family and friends where there is inconsistent reinforcement of cultural cues learned in the classroom since there are many levels of cultural knowledge and experience. WCM and BCM are developing a mixed use intentional and creative community in Cheyenne called Lincoln Court. If people are interested in some of the concepts and ideas about cohousing, check out these movies. “Aging Gratefully: The Power of Culture and Traditions” (Run Time: 30 min – 2017) My latest trek took me to South Africa where I’m investigating a third documentary in the Aging Gratefully series. This pilot is mostly based some initial research and my impressions that span from Tolstoy to Gandhi to Mandela to the present time. This is a 30 minutes pilot of my visit shot mainly on an iPhone 6s and I’m not sure if anything will come of this story. I’m collaborating with a fellow filmmaker, Pieter Lombaard, who appears in the short. We’re trying to figure out a good story with a great arc. What do you think? Click on this image and watch the two minute trailer. Click the ❤️ . You’ll be asked to log in with your facebook or set up an account. Please watch the trailer and give us a “like!” You’ll be asked to log in with your facebook account if you’re not already a vimeo user. The Wyoming Film Office gives away $25,000 to the winner that goes toward a Wyoming production. We’ll be making the movie in Grand Teton National Park this August. The top-10 are decided by popularity contest with no regard to production value. The winner is picked by a panel of judges based on the dogs selected by the production team friends and family – it’s click bait from the Wyoming Film Office. Everyone is having a problem with this, but it cuts down on those who sit at their computers and hit play, over and over. The main voting criteria has to do with promotion of Wyoming. Please watch the trailer and give us a “like!” You may have to log in with your facebook if you’re not already a vimeo user. “WY Am I Here”? What if a 62-year-old grandfather of six decides to climb the spectacular Grand Teton and make never-before drawn pastel views of the expansive landscape? Laramie artist Joe Arnold has been mountaineering for 50 years. He and his son, Jason, are planning an expedition to Grand Teton National Park for an ascent of the Grand Teton (13,776′) North Ridge route (rated 5.8). It will be a five-day bonding experience for two generations of climbers with an unusual but creative mission at the summit. How did I come across this project? I went to the Wyoming Arts Council CLICK! conference in Casper a couple weeks ago. I ran into Joe Arnold. We were each presenting about our art works at the conference. A couple years ago, Joe won a Wyoming Arts Council fellowship. I did a tribute video about his project which was a trek to Patagonia. We got to talking. I was looking for a movie to make for the film office contest. I thought about my two works-in-progress, but wasn’t inspired. Joe has a trailer finished, making it the perfect project. Take a look and click on the heart in the upper right hand corner of the video player. We want to get into the top-10 of the beauty pageant. It was a good run. Wyoming Community Media ended a nine year run of the FAST Filmmaking Festival (formerly the Shootout) and the Cheyenne International Film Festival. There will no longer be stand alone festivals or filmmaking contests, so watch for the Whistle Stop FILM Festival – WSFF, chugging into a town near you, not only in Wyoming, Colorado and Nebraska, but across the country. The 2015 edition of the Cheyenne International Film Festival is now accepting films for the May 26 – 30 event in Downtown Cheyenne. The 7th CIFF 2015 is now accepting entries. As usual, we’re partial to movies with Wyoming story lines, made by Wyoming people, and/or shot in Wyoming. Categories include shorts and features length documentaries and narratives as well as animations. The festival is May 25 – 30, 2015 in Downtown Cheyenne including the Atlas Theatre. The CIFF provides a way for local communities to discuss their issues within the safe haven of the arts. The entry fee is minimal, so please pay it. Check out the website by opening the CIFF logo on the left. Jackson Pollock and Thomas Hart Benton visited the Saratoga rodeo in 1938. 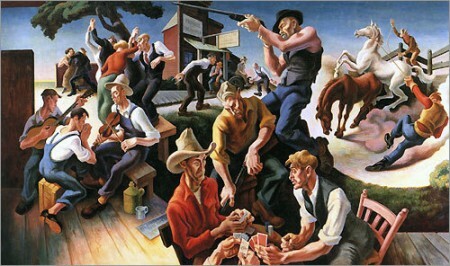 Benton painted this mural with Pollock as the harmonica player at the card table on the left. Production will happen when the weather breaks in the spring. The FAST Filmmaking Festival in Cheyenne screened the top movies and presented awards at the Historic Atlas Theatre in Downtown Cheyenne. The top films can be watched on the YouTube Channel. “Preservation” by Shawn Crochet and “The Diary of Robert Metchum Dodge” tied for Best Picture. Here are the films that played at the event, including the Cheyenne Historic Preservation Board documentary about the board’s work and it’s sponsorship of the FFMF.